CHINIOT/LAHORE: PPP Chairman Bilawal Bhutto Zaradri on Thursday visited the flood-hit areas of Chiniot district, announcing launch of a party campaign for rehabilitation of the affected people in his first fully-fledged public appearance in Punjab. Arriving at Chiniot by a helicopter, young Bhutto waded through knee-deep waters to reach the affected people and distributed relief goods among them. He told those devastated by floodwaters he had come to share their sufferings. “The PPP will launch a drive for rehabilitation of the affected people,” he said on the occasion. He also visited Rajoa Sadat village of the PPP’s former MPA Hassan Murtaza and spoke to the party workers waiting there for their leader who was making his first public appearance in Punjab. He urged the party workers to help the flood victims by all means. “It is the mission of Z.A. Bhutto and my Shaheed mother Benazir Bhutto to help the people in crisis,” he said. Bilawal was accompanied by senior PPP leaders including Raja Pervez Ashraf, Syed Khurshid Shah, Manzoor Ahmed Wattoo, Qamar Zaman Kaira, Sherry Rehman and Raja Riaz. Later, he flew to his Lahore residence — Bilawal House — and hosted a dinner for the party leaders and office-bearers. All district presidents, heads of different wings, former ministers from Punjab and former provincial presidents of the party were invited to the Bilawal House. The PPP Youth Wing’s request to the party chairman to address the workers at the Bilawal House could not be entertained. 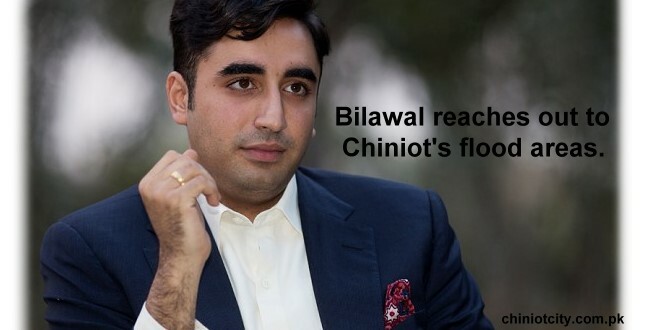 A PPP leader told Dawn that the Punjab government had provided security to Mr Bilawal for his visits to Chiniot and Lahore. He said the party chairman would leave for Multan on Friday (today) to meet flood-affected people there. The PPP had already dispatched 30 truckloads of relief goods for the flood-hit in Punjab. Party’s Punjab president Manzoor Wattoo said total 500 trucks of relief goods would be sent to Punjab to meet the immediate needs of the people hit by floods. Mr Bilawal has also ordered immediate purchase of tents worth Rs50 million to meet the temporary residential needs of the affected people.